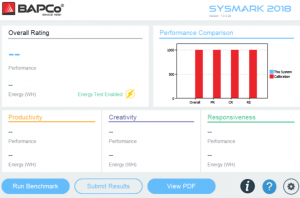 San Mateo, California – August, 15, 2018 – BAPCo, a non-profit consortium of leading PC hardware manufacturers, today released SYSmark 2018, the latest version of the premier PC benchmark that measures and compares system performance and energy consumption using real world applications and workloads. 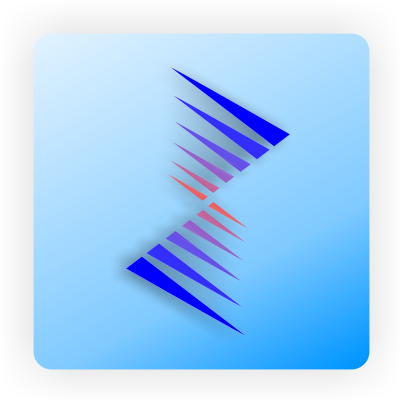 SYSmark 2018 extends the SYSmark family, alongside MobileMark® and TabletMark®, which have been widely accepted by IT Managers, PC OEMs, press and analysts worldwide. SYSmark reflects usage patterns of business users in the areas of Office Productivity, Creativity and Responsiveness. The new Productivity Scenario has updated workloads and applications geared towards office centric user activities. The new Creativity Scenario which has updated workloads and applications geared toward media centric user activities. In addition, the new Responsiveness Scenario models ‘pain points’ in the user experience when performing common activities that include: application launches, file launches, web browsing with multiple tabs, multi-tasking and background application installation. Using only unmodified, retail versions of real-world applications for measurement, SYSmark 2018 features new and updated versions of, among others; Microsoft Office 2016, Google Chrome & the Adobe Creative Cloud. SYSmark 2018 also includes an enhanced graphical user interface with localized GUI and documentation for English (US), Chinese (Simplified), German, Russian, Portuguese (Brazilian), Japanese, Spanish, Polish & French with a simplified “click and run” design. Reporting is available in a convenient combined, single result PDF. Results between SYSmark previous versions are NOT comparable with results from SYSmark 2018. 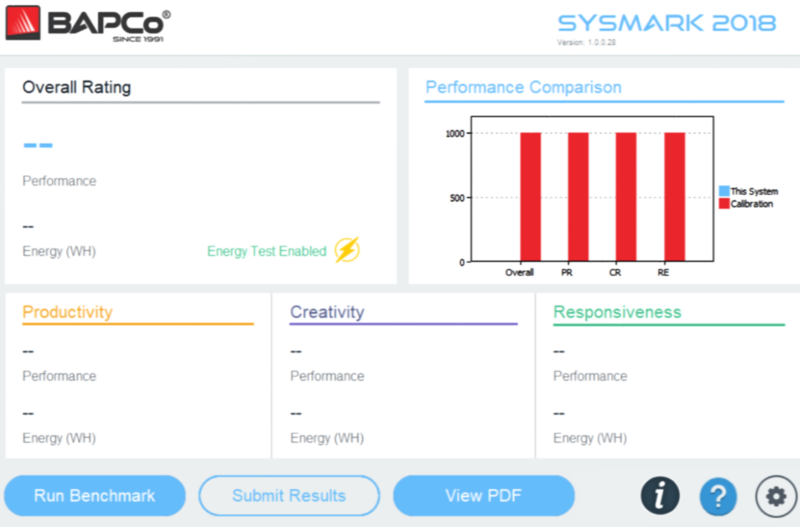 With the purchase of a supported power meter, SYSmark 2018 offers users the ability to measure energy consumption over the course of a benchmark run. This provides an easy to use tool allowing small businesses, corporations and government organizations to factor power consumption into their internal total cost of ownership procurement calculations. Flexible licensing options are now available for small business to enterprise organizations running 64-bit versions of Windows 7 and 10. Since 1991 the SYSmark family of benchmarks has been used by PC OEMs, hardware and software developers, IT departments, system integrators, publishers and testing labs as well as information technologists and computer industry analysts. BAPCo’s SYSmark 2018 is available from resellers and directly from BAPCo at store.bapco.com. Current BAPCo members include: Acer, ARCintuition, ChinaByte, CNET, Compal, Dell, HP, Hitachi, Intel, Inventec, LC Future Center, Lenovo, Microsoft, Pegatron, Quanta Computer, Samsung, Toshiba, Western Digital, Wistron, Zol and others. Any organization interested in contributing to the consortium’s goals and purposes are invited to join BAPCo. BAPCo, SYSmark, MobileMark and TabletMark are registered trademarks of the Business Applications Performance Corporation. All other names mentioned are trademarks, or registered trademarks of their respective companies.